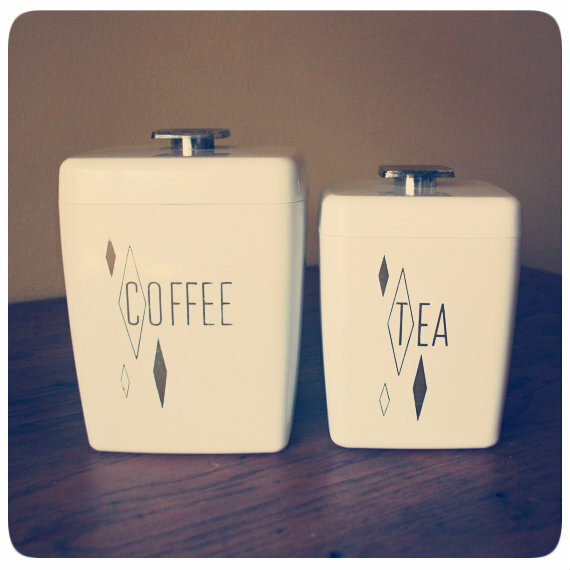 This week I'm obsessing over all kinds of retro Canisters for my Kitsch-en. Trying to pick out just a few sets was so hard, I found so many amazing designs, patterns, and colors! The ones above are Lustro-ware and are currently for sale in my shop! Here are some of my favorite Canister styles! 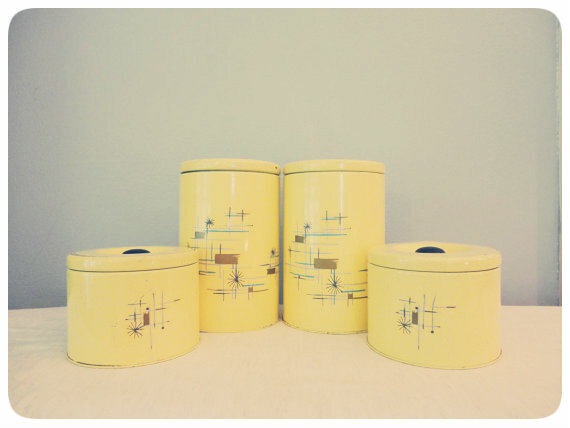 I love these stacking canisters! They are so cute, and save a ton of counter space! the cheery yellow is so pretty! These are my absolute favorite! I love the lettering and the metallic details, the colors would look great in my kitsch-en! The price tag however, is not so lovely. I love these little plastic canisters. They remind me of the Flintstones for some reason, so obviously I love them. 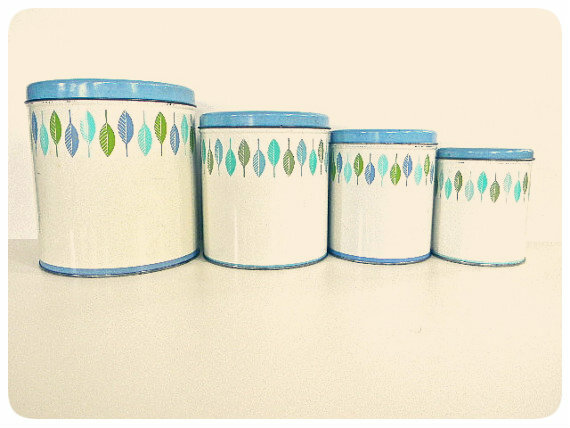 I love the feather print on these vintage tin canisters! 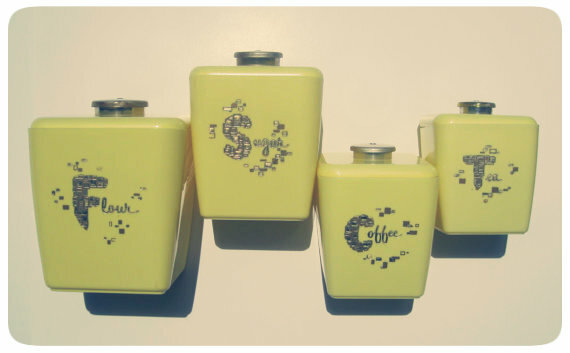 The mid century print on these yellow canisters is to die for, I love these! 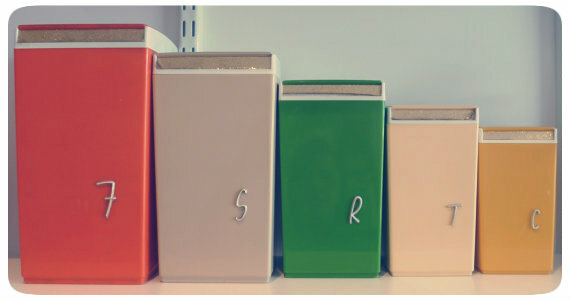 I think they would be perfect for organizing my supplies on my desk! This isn't a complete set, but if it was I would totally purchase these! I love the gold design! I pretty much want all of these in my kitchen. I know! I don't even know which ones to pick! 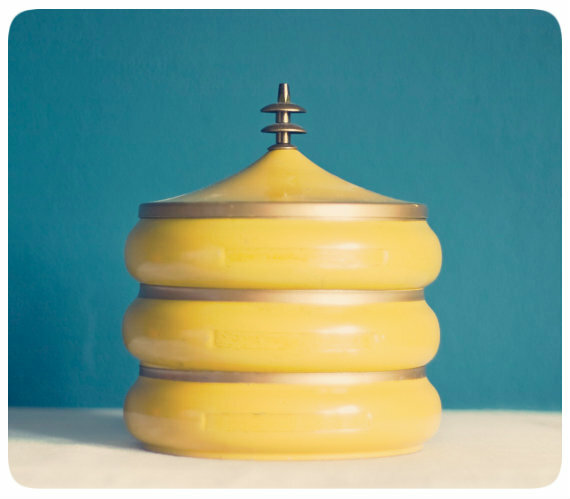 I'm a huge sucker for vintage canisters, too. I always scoop them up whenever I encounter them. The round-up you have here is perfect. Cute blog! :) Love all the vintage kawaii everywhere. I love all of these, I don't even know how to pick. Well, I guess I would pick the stacking canister because I've never seen one like that before! Love it and the color. there are a few different styles like that ive found1 look them up on etsy and im sure you can find so many more colors and styles! I love all of these! Why in the world are number two $170ish! My college student budget can't handle that, but they are my fave! I know! Unfortunately they are from an Australian company so they are super rare and hard to come by! They are my favorite as well! I have a thing for stacking canisters right now and trying to find ways to incorporate them with other things besides my kitchen. Any ideas? Golden Hues : Natural Dying with Foraged Golden Rod. First TWOI of the Fall! Thrifty Finds Under Twenty and a Penpal Update. Sunday Funday in Full Swing!